ProForm Treadmill Reviews by Industry Experts! Getting the Most Value For Your Money! ProForm is the largest selling brand of Icon Fitness, which is the world’s largest fitness equipment company. (Icon also builds NordicTrack Treadmills).We‘ve been to the corporate and manufacturing facilities of ProForm on several occasions and have met with many of the top executives and engineers. Years ago, ProForm primarily dominated the budget category, but now they are also a major player in the mid-range ($1,000-$2,000) market. 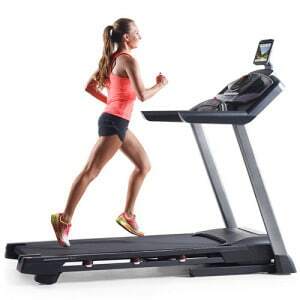 There are two reasons why ProForm treadmills are so popular. First, you get more for less. Second, they have the most innovative technology in the industry. Icon Fitness devotes considerable resources to cutting edge motivational technology. 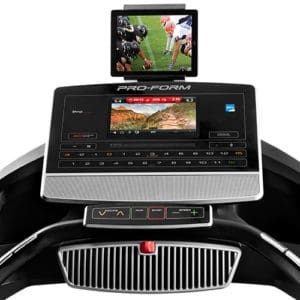 See a comparison chart of all ProForm Treadmills here. Great Value for Your Money —ProForm has the advantage of economy of scale because they are part of the largest fitness equipment company in the world. They manufacturer large inventories of machines, which drives the unit prices down. Consequently, most of their treadmills out-spec the competition. In general, their treadmills have larger motors, longer decks, more features and the most innovative technology in the industry. In addition, they come with generous warranties. For example, in the budget category you have the Performance 600i treadmill, that usually sells for $799 with free shipping. First off, this is not a lot of money for a good cardio machine. It has a 2.75 HP motor, an extra long 20″x 60″ running surface, decent sound system with MP3 input, 22 workout programs, a lifetime motor and 2-year parts and 1-labor warranty. It is also iFit Coach Ready. Compare that to other $799 treadmills in the market, and you’ll see that other companies only provide a very basic machine for this price. Another indication of their value are“Best Buy” ratings for the ProForm machines from a prominent consumer magazine, whose name we cannot mention. They’ve given the Performance 600 an “excellent” rating for exercise range and ergonomics. Innovative Technologies — Some of the state-of-the-art features found on ProForm and NordicTrack treadmills are what really distinguishes them from the competition. They have an entire department devoted to research and development. When we go to visit the company, this area is completely off limits to visitors — they take research and development very seriously. 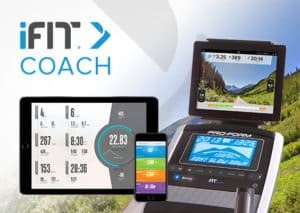 iFit Live — iFit Live allows your treadmill to communicate with the Internet through Wi-Fi. There are several features designed to motivate you to achieve your fitness goals and to take the boredom out of walking or running in place. Customized Workout Routines: You go to iFit.com and define your exercise goals. An 8-week program is downloaded on your machine, which allows you to workout with Jillian Michaels, who provides audio coaching. In addition, your results are uploaded in real time to your iFit.com account, allowing you to track your progress. Studies show that individuals who track their progress are more likely to achieve their fitness goals. the incline feature. There is also a library of pre-designated routes through national parks and famous city-scapes. Furthermore, you can place your smart device or tablet on the treadmill and see either a street, map or satellite view of the route you are running. Some of the machines have a built in Smart HD Touchscreen display so you can view your iFit route and stats directly on the machine. For example, check out the 7″ Smart HD Display on the Power 1295i or the Pro 5000. Want something bigger? Try the 10″ Smart HD Touchscreen on the Pro 9000! Full Color Touch Screen Display with Android Internet Browser — Several ProForm machines, including the PRO 9000 and the Premier 1300, come with a display that allows you to access your email, catch up on the latest news, view your favorite web sites, listen to music online, and watch YouTube videos — all while you burn away those unwanted calories. Superior Sound Systems with MP3 Input — Many elliptical trainers have speakers that are so poor that you wouldn’t even want to listen to them. Icon Fitness equips their cardio machines with some of the best sound systems found in the industry. Decks that Both Incline and Decline — Several of the ProForm treadmills, including the PRO 9000, PRO 5000, and PRO 2000, have the ability to both incline and decline the deck. This allows you to simulate going up and down hills, in addition to being able to target more lower body muscles. BEST BUY! – ProForm Power 995i – Read full review here. Built-in Fans — The fans on most ProForm treadmills actually offer relief. They are designed to point at your core, which is the most important part of your body to cool off. They have a couple of models where the intensity of the breeze is based on the level of your exertion. Generous Warranties — You will find that the warranties on the ProForm treadmills are some of the most extensive in their price range. In fact, the PRO 9000 has a lifetime motor, 5 year parts and 2 year labor warranty. 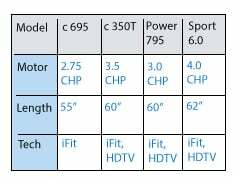 Some of the ProForm machines only have a 25 yr warranty on the motor, so make sure you check out our comparison chart here. 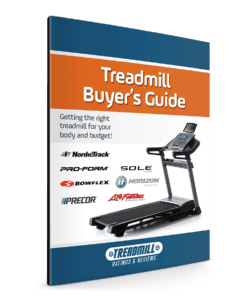 ProForm treadmills are all about value, and getting the most for you money. Because they succeed so well at this proposition they sell massive amounts of treadmills per year. If the ProForm treadmills did not have features like iFit Live, full color displays, and the ability to incline and decline they would still be a good value because of the upgraded components. However, when you factor in the innovative features you get an excellent value on a number of their models. See a comparison chart of all ProForm models here. “I am 220 lbs and 6′ 5” – and this treadmill handles me at a full out run with no problems. It is quiet too. The 8 pre set programs are amazing, and I can’t believe how fast this thing will go. WAY faster than I can run!!!! Note: In the ProForm reviews we attempt to be as accurate as possible. Particularly with this company, they have a tendency to change features frequently.